The car has been redone, and yes, it’s stunning. But the real story began in the ‘50s when Floyd, at age 13, fell in love with ’32 Fords. His earliest Deuce memories were of watching the hot rods and customs cruise up and down Bellflower Boulevard, as well as a very special Deuce three-window coupe. That Bellflower Boulevard memory stuck, and he vowed one day to own a ‘32 Ford. Now in his late-60s, Floyd was finally able to afford to enter the ethereal world of all-original Deuces. One evening, after 10 years of unsuccessful searching, second cousin Rick Henry entered the picture. It seems Rick was doing an exhaust on an original Deuce cabriolet and asked Floyd if he would be interested, for no other reason than just to check it out. The next day was a Saturday, so why not catch up with Rick and have a look at the car. It was definitely something that would work, but alas, it wasn’t for sale. Though, Rick did mention that the same guy also had an original ’32 Sports coupe for sale. 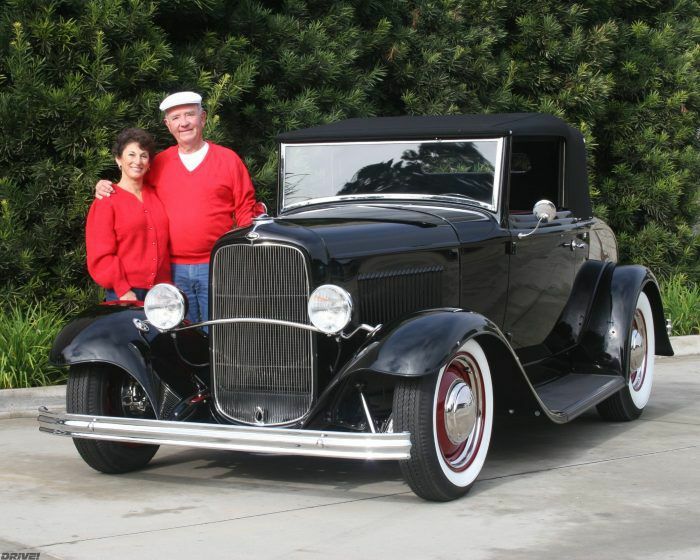 A few months passed before Floyd and Darlene had the opportunity to make the trek to San Clemente and peruse the Sports Coupe. Both the ’32 Sports coupe and the ‘32 Ford cabriolet were there, and owner Gary Gillette offered the couple a ride in the coupe. With the formalities behind them, they asked the price on the coupe and told Gary they’d head home and think it over. On Monday morning over coffee, the Dotys chatted about cars in general. Darlene asked about the coupe and Floyd told her that he liked both cars but really wanted the cabriolet, which of course was still not for sale. She asked him what he was going to do, and he said, “Well, I’m almost 70 years old, the cabriolet is the one I really like, but it’s going to take some time to ﬁnish. It’s not in running condition, and I don’t know if I’ll live long enough to see it done.” Making a radical decision, he offered Gary a deal on both cars, and on Aug. 20, 2005, both cars were in the Doty garage. Cousin Rick worked weekends and evenings on the cabriolet for about five years. 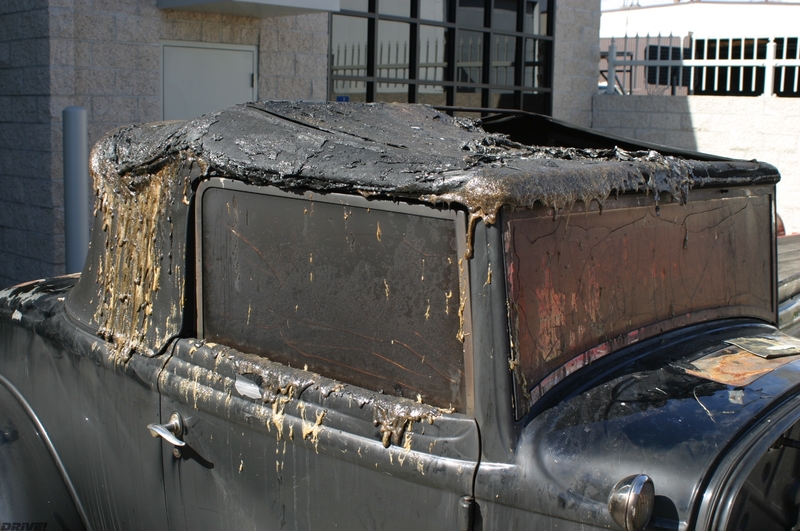 It was 95% complete, sporting a fresh Gabe’s interior and top, but before he could finish the car, it was engulfed in a fire at a tune-up shop. The Dotys were in Wyoming at the time and received a phone call from Rick so distraught that he was nearly speechless. Rick was so upset he suggested that once the insurance issues were settled SO-CAL Speed Shop should handle the hot rod’s restoration. The car was moved to the SO-CAL Pomona Car Shop in early 2012, and Jimmy Shine and crew worked non-stop, finishing the car just in time for the Dotys 2012 Christmas card and family celebration. Like the mythological phoenix rising from the flames, Floyd and Darlene’s Deuce cabriolet has come through fire renewed. The project was in all honesty a monumental and moving experience for all, me included.